A hearty vegetarian dish that can also be prepared ahead, making it perfect throughout the year but especially when entertaining at Christmas. Preheat the oven to 200°C, gas mark 6. Peel and deseed the squash, then cut into thin discs or half-moon slices, about 5mm thick. Place on a baking tray, coat with the oil and sprinkle with sage. Bake for 25 minutes until soft. Meanwhile, start the béchamel sauce. Pour the milk into a pan and add the onion and sage. Bring to a simmer, then remove from the heat and set aside for 10 minutes to infuse. Melt 25g butter in a large frying pan over a medium heat and add the mushrooms. Season well and fry for 6-8 minutes until soft. Increase the heat, stir in the garlic and fry for a further 30 seconds. Remove from the heat and set aside. Strain the infused milk through a sieve, discarding the onion and sage. Heat 25g butter in a small pan, then add the flour, stirring continuously. Slowly whisk in the milk. Simmer for 3-4 minutes, whisking continuously until smooth. Season and pour in any cooking liquor from the mushrooms. Set aside. Rinse the spinach and place the wet leaves in a large pan. Cover and cook over a high heat for 2-3 minutes until wilted, then remove from the pan, draining off any liquid. To assemble the lasagne, spread 2 tablespoons of béchamel sauce in the base of a small baking dish, about 15cm x 22cm. Place a sheet of lasagne on top. Top with 2 tablespoons of béchamel, then spread with half the mushrooms and sprinkle with a quarter of the cheese. 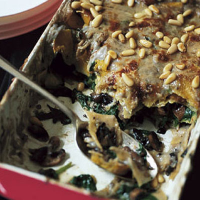 Repeat with a sheet of lasagne, 2 tablespoons béchamel, all the spinach, the remaining mushrooms and a quarter of the cheese. Then repeat with a sheet of lasagne, 2 tablespoons béchamel, three-quarters of the squash and a quarter of the cheese. Finish with a final sheet of lasagne, and top with the last of the squash, the remaining béchamel and the remaining cheese. Loosely cover the top with foil and bake for 30-35 minutes until golden, removing the foil halfway through. Sprinkle with pine nuts and serve immediately with a rocket salad. You can prepare this lasagne in advance. Make to the end of step 8, then leave to cool completely before freezing. Cook for 35-40 minutes from frozen, until piping hot.